"We need to discuss the complete disconnect between the marginal product of labour and labour wages," said Sir Chris Pissarides, speaking on the closing panel of the Lindau Economics Meeting. "Quite why marginal productivity theory is still taught as something which explains the real world is beyond me," commented Laurie. Marginal productivity theory says that profit-maximising firms will only employ workers who can generate at least as much additional return for the firm as they are paid. Expressed like this, it seems sensible: why would a firm employ a worker who is a net cost? But marginal productivity theory also says that the amount firms pay their workers is equal to their marginal product - in other words, that wages rise in line with productivity. This is demonstrably untrue. Wages have not kept pace with productivity for the whole of the 21st century. Workers' wages simply don't reflect their marginal productivity any more. 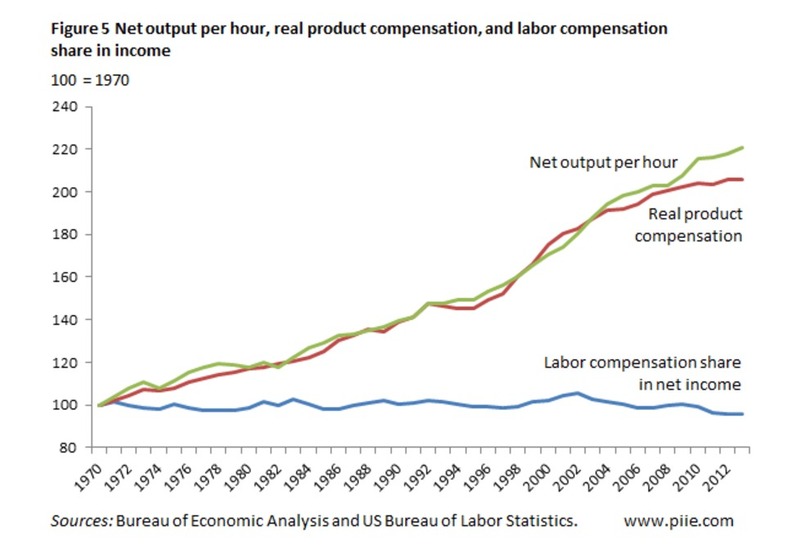 Productivity started to outpace workers' compensation (wages plus benefits such as healthcare and pensions) some time in the early 1970s. 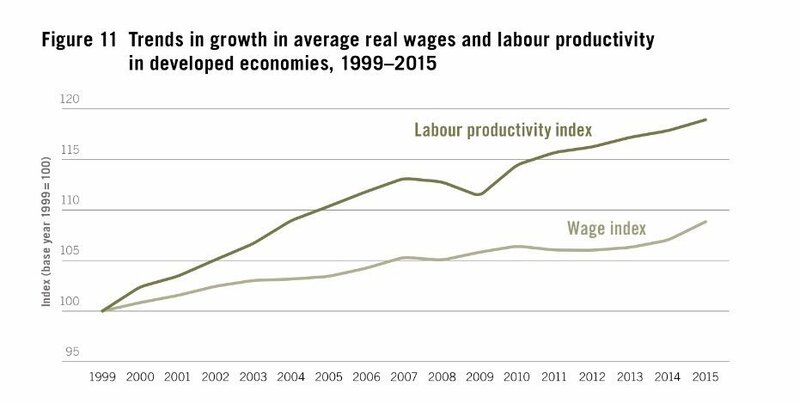 Back to Laurie's chart, then - though not everyone is convinced that the divergence of productivity and wages is entirely a 21st century problem. globalisation: the entry of large numbers of people in developed countries, particularly China, to the global workforce has created a labour supply glut. Dorn, Autor and Hanson explain how the "China Shock" has destroyed jobs and depressed wages for manufacturing workers in the USA. Replacing skilled workers in developed countries with skilled workers in developing countries at lower wages itself widens the gap between wages and productivity. In developed countries, there is a further effect, which we might term "hysteresis": displaced skilled workers, unable to find work that uses their skills, are forced down the jobs hierarchy, creating a glut of unskilled labour. The combination of disappearing skilled jobs and rising demand for unskilled jobs depresses wages along the job distribution, except at the very top. Kremer & Maskin show how global job competition raises inequality in developed countries. technology: the "skilled middle" are losing out as their jobs are automated. As Ryan Avent explains, robots who can do skilled routine work faster, cheaper and better displace humans, who are forced into low-skill, low-wage, low-productivity jobs such as care work and hospitality. This creates a productivity boom for robots, coupled with declining wages for humans. 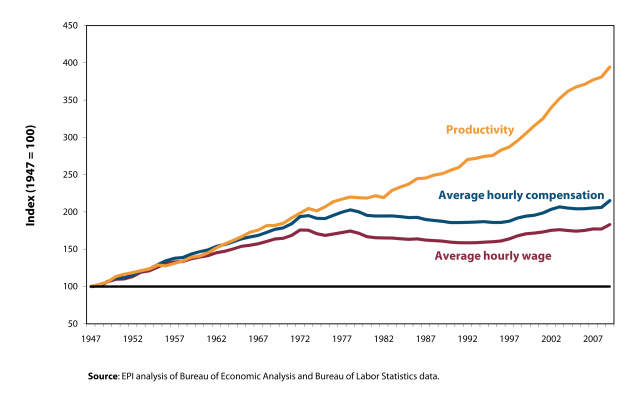 Hence the productivity-wage divergence. 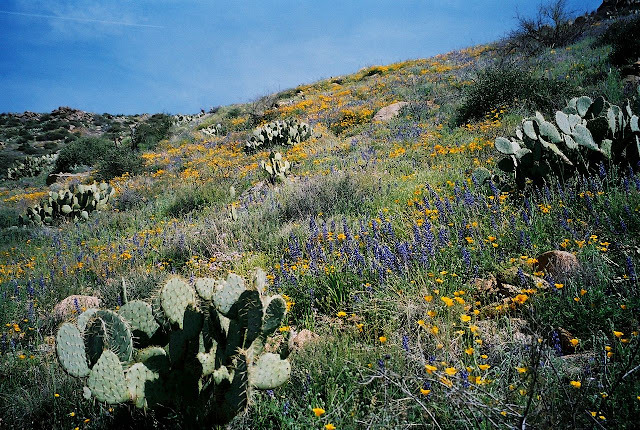 Noah Smith thinks that the first of these effects offsets the second to some degree. He says that the China Shock discouraged firms from investing in technology. After all, why invest in expensive machinery when there is a glut of cheap humans? He has a point. It's not much of a productivity boom, really - the divergence is mostly because wage growth is truly awful. 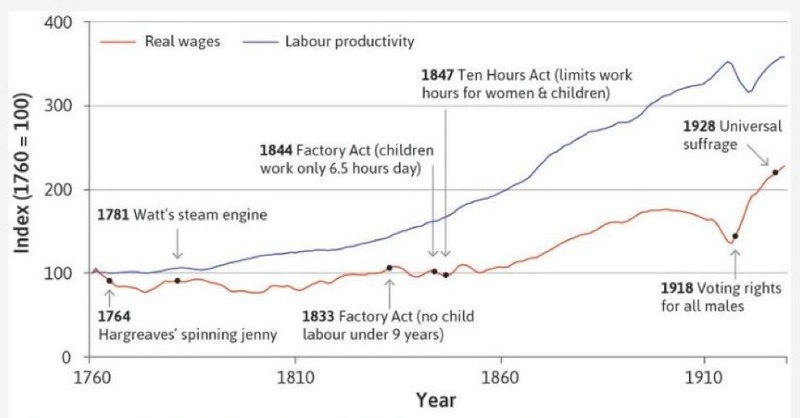 One of the mysteries of the "technological revolution" is why, with all those robots, productivity gains are so poor. But whether the productivity-wage divergence is caused by China or technology, or both, underlying it is a human tragedy. People displaced from skilled jobs can be permanently hurt: when large numbers are affected, the result is long-term degradation of the workforce, accompanied by rising poverty and associated mental and physical health problems. "Hysteresis" is too dry a term for such misery. Tyler Cowan calls it "unemployment scarring". However, Noah thinks that the China shock, and associated hysteresis, is backward looking. The China shock is largely ended, as China's wages rise to Western levels and its middle classes grow. It will never return. Looking back further (to pacify those who disagree with Lawrence's dismissal of productivity-wage divergence prior to the year 2000), the entry of women into the workforce and the post-war "baby boom" were both positive labour supply shocks from the 1970s. They, too, will not be repeated. 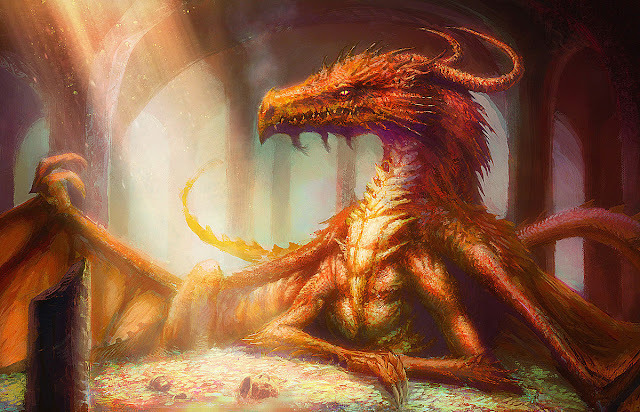 And as for all those scarred humans - yes, it is sad, and they are understandably angry, but eventually they will reach the natural end of their working lives, and those who come after them will benefit from new types of jobs arising from the new technology. Looks amazingly similar to Laurie's chart, doesn't it? It is, of course, subject to the same criticisms. It compares productivity with real wages, not total compensation, it is probably deflated by CPI not the business deflator and it doesn't account for use of capital. However, thanks to Thomas Piketty's work we know that during this period capital grew enormously, so it is hard to argue that all - or even most - of the productivity gains went to labour. Nonetheless, this chart tells an important story. Industrialisation changes the composition of the workforce. As prosperity rises, marginal workers such as the old, the sick and the disabled are able to leave the workforce and be supported from the earnings of more productive workers. Children, too, leave the workforce so that they can be educated, thus improving their skills and their future productivity. The chart shows when children left the workforce: the old, sick and disabled left it in the early 20th century (the first old age pension was introduced in 1908). Interestingly, in 1847 women also left the full-time workforce, after which male wages rose. This could simply be a compositional effect, of course. Women and children were paid less than men. If you remove lower-paid people from a workforce, the average wage rises even if there is no rise in individual pay. I am unconvinced. Despite the rise of labour unions during this time, real wages did not keep pace with productivity. Indeed in the last couple of decades before World War I, real wages actually fell despite rising productivity. The exit of less productive workers from the workforce, coupled with fast technological change, should have enabled both wages and productivity to rise, especially if the stronger workforce that remained developed industrial muscle because of growing political power. Perhaps population increase and the contribution of lower-paid workers in Britain's growing empire prevented wages from rising as much as they should. After all, if globalisation can depress wages in the 21st century, so too could it have depressed them in the previous golden age of global trade and industry. But this chart shows that the gap between wages and productivity did close, after World War I and the extension of voting rights to all men. Allegedly, a similar thing happened after the Black Death in the 14th century. It's amazing what wiping out a large proportion of your most productive workers does for wages. 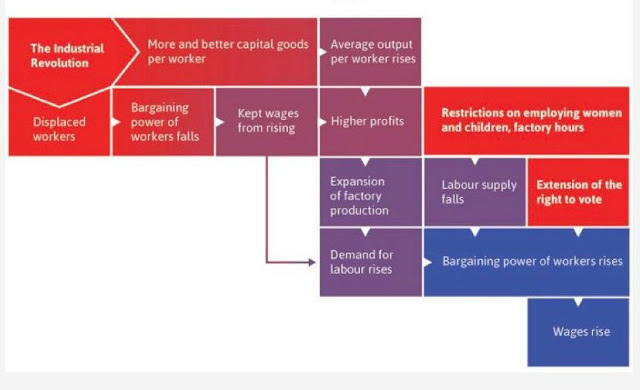 As CORE says, falling labour supply increases bargaining power, and that in turn raises wages. This brings us to the future. Is it really going to be as bright as Noah seems to think? Looking ahead, workforces are set to shrink significantly as birth rates fall and populations age, not only in developed countries but also in developing countries - including China. The OECD forecasts that by 2050, one third of the global adult population will be 65 or over. In some countries, such as Japan, Germany and Korea, the proportion will be much higher. Charles Goodhart predicts that the global decline in the working-age population will tighten labour markets, pushing up wages. Rising wages might in turn encourage firms to invest in technology, thus improving productivity. It's sort of the marginal productivity theory backwards (or Karl Marx, if you prefer). If firms have to pay more for their workers, because a tight labour market means there aren't so many of them, they will have an incentive to invest in technology to enable those workers to produce more. Though they might invest in technology to replace those workers, of course. But as CORE points out, when there are fewer workers, governments fight on their behalf. Social safety nets enable workers to refuse poorly paid, dangerous and degrading work, while regulation prevents companies from offering such work or mistreating workers in other ways. So, if labour markets tighten as Goodhart envisages, then the lot of workers might improve quite considerably. There is some historical support for this argument. World War I was a very large negative labour supply shock, and it was followed fairly quickly by an even larger one, namely World War II. The power of labour unions reached its zenith in the rebuilding after World War II, when there was much to be done and not all that many people to do it. This was also the golden age of the welfare state, when governments promised "cradle to grave" support for workers and their families. But as labour markets slackened due to the positive labour supply shocks of the 1970s onwards and the advent of globalisation, governments took to fighting for companies against their workers - systematic destruction of union power, preferential tax treatment of capital and corporate incomes, watering down of employment standards and practices. And as social safety nets are progressively shredded, marginal workers - the old, the sick, the disabled, mothers of young children, students - are coming back into the workforce. Some, of course, are coming back willingly, attracted by the possibility of higher incomes and a better standard of living: but for too many, the work they are being forced into is simple drudgery, making an already difficult life much worse. The concept of work as a moral imperative - the "workhouse ethic" - has returned, with attendant harshness. The re-entry of these people to the workforce is almost certainly depressing both productivity and wages. This has now gone too far. It is time to redress the balance. Of course, the unions of the past are not coming back: they are as redundant as the "human robots" they represent. We need to find ways of supporting and empowering the displaced and atomised workers of today. But I look at technology, and I look at the CORE chart, and I wonder with Laurie whether wages in profit-maximising firms (which is all privately-owned firms, of course) ever really relate to productivity. After all, if what you want to do is maximise profits, you want all the gains from increased productivity to go into profits, not into workers' pay. The Marginal Productivity of Wages theory correctly identifies the maximum a firm will pay, but it is completely wrong about the minimum. If the worker's job is under threat, and the social safety net has been shredded, and union power has been broken, the minimum is all but zero. Employers have an incentive to bid down wages to the floor if they can get away with it, regardless of productivity. Mind you, bidding down wages to the floor has consequences for productivity. If employers have an incentive to pay as little as they can get away with, equally workers have an incentive to do as little as they can get away with. So, if wages are low, productivity is likely to be too. After all, as the Russians say, "They pretend to pay us and we pretend to work". Frankly, I'd rather have an economy where robots did the work and humans pursued other creative and caring interests. I think it would be not only more productive, but a much nicer way to live. Bring it on. Great post with some insightful historical facts. One suggestion for the 'mystery' of declining productivity in our highly technological age: in theory the machines can increase output at a much faster pace than human labor can, but in practice they do not because there is no one left to consume the output as humans are employed (US unemployment close to record low) but insufficiently paid (these same machines put downward pressure on human wages) -> potential AS is much higher but because of insufficient AD, actual AS naturally declines to balance it out. It is very easy to raise productivity by just paying humans NOT to work (denominator in the productivity equation goes down). It does not have to be by the government. Depending on the industry (financial services for example where there is surplus labor) the corporates can do that themselves at no extra cost to their profits (human labor does not produce 'value'). A kind of corporate UBI (which is what is happening already now, as you say - "they pretend to pay us, we pretend to work" - there is no point for these workers to stay on the books to begin with - it only lowers the productivity measure!). We can really increase productivity if we top up this corporate UBI with government UBI - then AD goes up and output follows (numerator of the productivity measure also goes up). 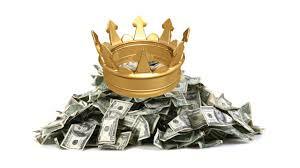 Bottom line is ever since the Agricultural Revolution, which produced the first capital surpluses, it is AD that has lagged. AS is never the problem but in times of wars/revolutions or natural disasters. Nominal UK wages are not being cut but inflation is reducing purchasing power meanwhile corporate profits increasing from exports until Brexit when they will normalize ie revert to previous levels and lead to wages being reviewed. Wages, in practise, correspond not to marginal productivity of labour, but the salary that the employee can get from a competitor. And that, as you identify, has been bid down to the floor. Employees are also further constrained by non-compete clauses and the like. However, if you look at firm incentives at the moment to move operations to a lower wage location, the solution will have to be a global strengthening of unions. After reading about the globalization and technology explanations, and then about how the safety net has been shredded and unions made powerless, I still miss something very important. Is there any reason that corporate concentration is not a reason for this? With globalization, tech and financiarization driving all sectors to concentrate more and more, I would think that's the obvious culprit. There are three ways I see bigger companies driving wages below productivity. First, monopoly power in labour market: more workers, less companies. Second, larger companies have larger hierarchies, empowering more levels of managers to extract rents from their underlings. Empirical data says that in-company inequality is growing, and the whole leadership ideology and rhetorics works as an alibi for that. Third, some of the productivity improvements that larger companies make, often, are nothing more than squeezing their suppliers. Who, in turn, squeeze their own workers. That sure happens, but I don't know how important it really is.